A unique and safe alternative to real sticks, Kong SafeStix are a unique fetch toy, sure to provide hours of non-stop excitement and entertainment for active dogs who love to play outdoors. 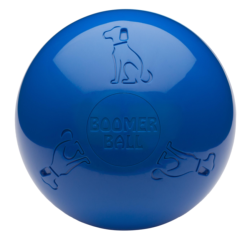 Made from tough, non-toxic rubber, the flexible SafeStix twist and bend to encourage an amazing throw and fetch experience for both you and your pet. The rounded ends prevent the toy from lodging in softer muddy ground, while the toy floats easily on the surface of water for easy retrieval. Available Colours: Blue, Green and Red. If you would like to choose a colour, please specify which colour you would prefer in the "Special Instructions" box during the Checkout process. We will do our best to honour colour requests. If no colour preference is specified, we will supply a random colour. 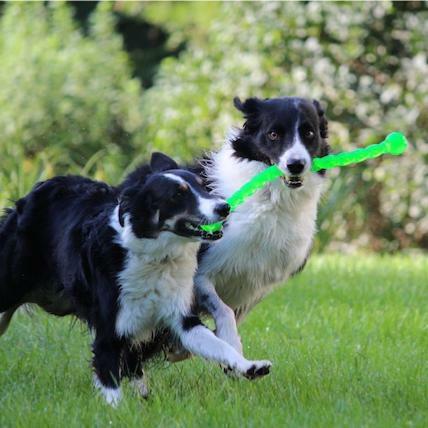 Always choose toys that are the appropriate shape, size and strength for your dog, and monitor their use. Remove the toy from your dog if it shows signs of damage. Boomer Ball Pursuit Toy 6"